So you don’t miss out on hearing the important things. 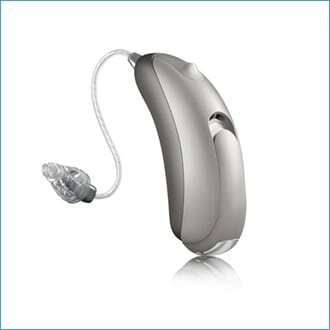 A full range of hearing aids are available from various manufactures. Healthy competition exists in the market place, led by technological innovation and performance features, which are constantly evolving. We will do our best to find a solution for you that’s right for you. 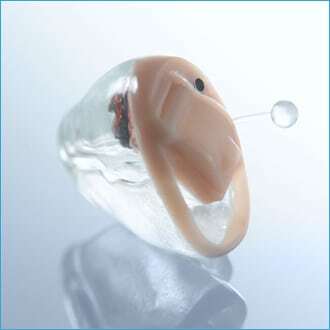 These are the smallest of hearing aids, that fit deep within the ear canal, making them truly invisible. A single microphone relies on the ears ability to capture sound. Requires an extraction cord to safely remove. Good for mild to moderate hearing losses. Limited battery life of 3 to 5 days average. Dependant and the size of the ear canal. Limited features due to size. Available at Standard Plus to Premium technology levels. Similar to the IIC hearing aids, they fit in the ear canal however are generally just visible in the entrance of the ear canal. A single microphone relies on the ears ability to capture sound. 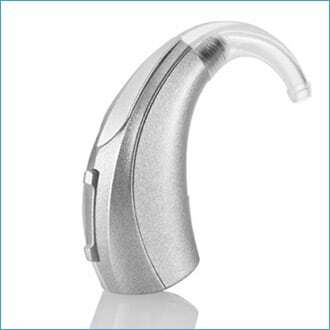 Suitable for wide range of hearing impairments. Available with wireless features across all technology levels. Can include a control button. Fits in the entrance of the ear canal. Directional microphones allow better hearing in noise. Better battery life 5 to 7 days. Feature rich without compromise, depending on level of technology. More visible if no hair covers the ear. 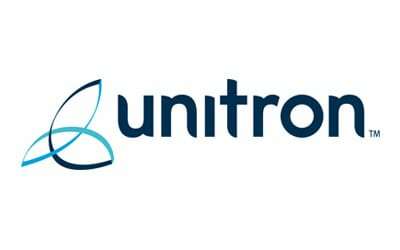 You can try before you buy with Unitron Flex Trial Hearing Aids. Traditional NHS style hearing aid. Either with a thin or standard size tube running down the front of the ear into a mould or rubber dome. Battery life of 10 to 12 days. Available in all technology levels. Suitable for all types of hearing impairments. 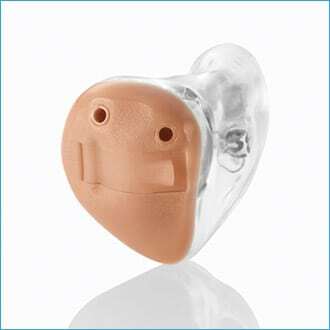 This is one of the most popular designs in hearing aids, combining the superb sound quality features of an in the canal hearing aid where the speaker is located near the eardrum with the benefits of the microphones on top of the ear. Virtually invisible from the front. Very comfortable in the ear. Suitable for most types of hearing impairments. May forget they are in the ear. Ever thought of having hearing aids built into your spectacles? 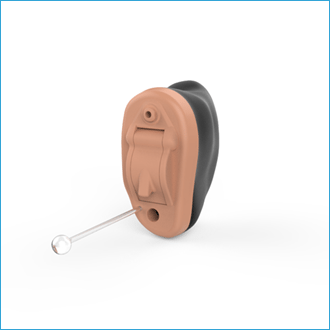 Produced with detachable arms Bruckhoff Spectacle hearing aids are made to fit. 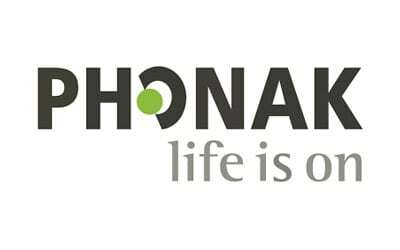 Bone Conduction and Speakers In The Ear hearing aids available with 2 technology levels. We will even contribute to the cost of your new spectacle frames and lenses. 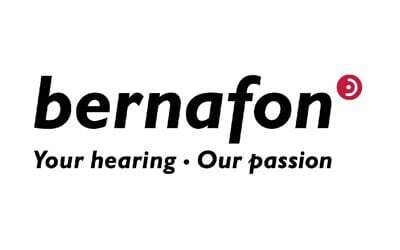 Suitable for people with wide range hearing deficits. 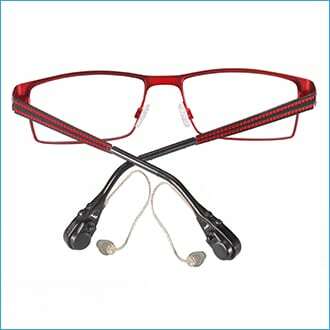 No trouble with hearing aids getting in the way of your spectacles. Detachable arms allow you to remove hearing aids if necessary. Can be set up to clip onto a second pair of spectacles. There are some restrictions on spectacle frame arm size. You need to wear your spectacles to wear your hearing aids. There is some fitting restrictions for people who require Bone Conduction hearing aids. Find out more about the technology in hearing aids and discover which is the best fit for you.